Lynyrd Skynyrd is coming to town next month, but I’m not going to see them. Truth be known, I’ve never been much of a concert-goer. But there was that time in the summer of ’76. I was 19 and enjoying a fairly easy existence, working my way through college as a part-time welder, which gave me spending money and helped me pay tuition. I had some extra spending money and a bunch of friends were going to see J. Geils, Lynyrd Skynyrd and ZZ Top in concert at Tulane Stadium in New Orleans in July 1976. So I joined in, riding with Merrill and Robert and several others in their dad’s work van to New Orleans. We had a great time, drank a lot of beer on the way and even more when we got there. Legal age then was 18, though we’d been partying together since we were in junior high. The football field was packed and we ended up sitting in the stands of the old stadium, the former home of the New Orleans Saints that hosted one of the early Super Bowls before the Superdome was built. The Saints were housed in the dome by 1976 and even Tulane played its games in the dome by then. J. Geils was up first and put on a decent show, from what I remember. It was late afternoon and hot and by the time they came on, we’d consumed a lot of beer and partook of things that weren’t legal for us to to do, if you know what I mean. The old metal stadium was rocking and rolling. Lynyrd Skynyrd was supposed to be up next, but they had plane trouble and cancelled at the last minute. A big fight broke out on the field when they announced Lynard Skynyrd was a no-show. The police started clubbing people, including a woman who stood in their way asking them to stop clubbing people. That’s when everybody started throwing things at the cops. Tear gas and beer bottles went flying through the air on the football field. We were in the stands, but we did make some strategic throws with beer bottles. Someone threw an ice chest over the top of the stadium as the police left with a couple of guys in handcuffs. it landed near the cops and ice flew all over. ZZ Top came out after things calmed down and put on a hell of a show. The riot was so ugly that Tulane never allowed another concert there and they eventually tore the stadium down. A year later, three Lynard Skynyrd members died when the same plane that broke down before our concert crashed in Mississippi on its way to Baton Rouge. I’ll probably stay home and watch TV when they’re in town next month. I’m just a simple man. I have loved Pizza Hut’s supreme sandwiches ever since I moved to Florida and discovered no one there knew how to make a good po-boy. I used to eat them for lunch all the time, even when I moved back to Louisiana. (I mean you can only eat so many shrimp po-boys, you know.) And then I moved to Tennessee and had neither. For some reason, as soon as I crossed the state line, Pizza Hut quit selling sandwiches. I was devastated. No po-boys. No supreme sandwiches. And with the demise of the old Pizza Hut in Thibodaux, I couldn’t even a get a Pizza Hut sandwich when I went back to visit. If you must, this is the time to put the rabbit food on. Drizzle Italian dressing on the sandwich and then close it. Cut in two. Serve with a cold beverage and potato chips (Ruffles is what Pizza Hut used). I’ve never liked tuna salad. There was something about its fishiness that just never really appealed to me when I was growing up. I felt the same about chicken salad, but in that case, it was the dish’s blandness that never got me past the mushy texture enough to like it. Plus, I’m not a fan of raw onion or celery and both dishes seem to always incorporate them. My mom tried. Friends have tried. My ex wife tried. I just never cared for either type of sandwich. Until the day of my mom’s funeral, when I bit into one of my cousin Jeannie’s chicken salad sandwiches by accident, thinking that it was an egg salad sandwich instead. Jeannie has fed many a church function with her chicken salad sandwiches, using an industrial sized recipe that involves a food processor, a whole chicken (deboned), a dozen boiled eggs, almost a whole jar of mayonnaise and a variety of other ingredients that include bell pepper, green onions and pickles. Her recipe makes 35 sandwiches. I haven’t tried it yet. I was watching “Chef at Home” on the Ion channel the other day and chef Michael Smith made tuna salad sandwiches using canned tuna, which got me to thinking: What would Jeannie’s chicken salad taste like with tuna. I like sashimi tuna and tuna sushi, so why not give canned tuna a try again? I picked up a couple of cans of white tuna packed in olive oil, thinking that olive oil has to be better for you than briny water. I experimented on Saturday and today. I may be on to something. Mix the eggs, tuna, mayonnaise and relish together, then add the seasonings and mix some more. I’m going to try a variation on this with chicken next time I have leftovers. I haven’t blogged much because there hasn’t been much to blog about. I picked a cabin style I like, worked out financing with my credit union, found a contractor to handle the foundation, found a supplier for my cistern and its components, and moved the land cost off my credit cards before interest kicked in. While that’s a lot of activity, it’s mostly phone calls, emails and texts. The biggest issue I am facing right now is getting the grass cut so ticks and chiggers aren’t a problem. I’m not doing so well with that. I didn’t winterize my lawn mower and ended up putting bad gas in it last week. The short version is it won’t start. The longer version is that no matter what I do, it won’t start. Since I only paid $120 for the lawn mower new, I can’t see me spending money at a repair shop. I cut half the yard with my weed eater last week. I couldn’t grasp an object the day after. 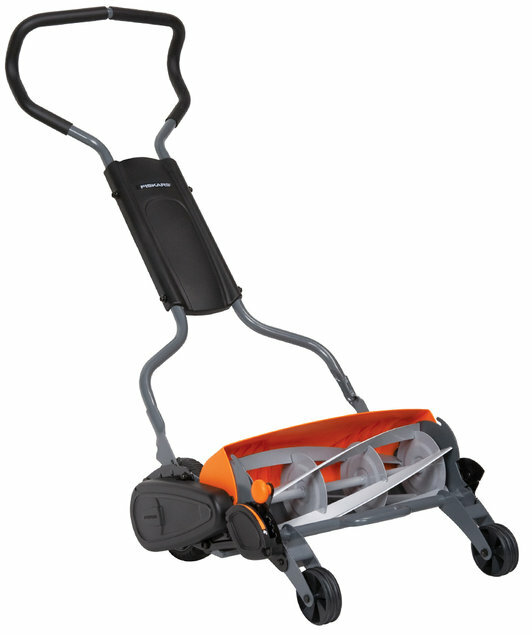 So this afternoon, in a feat of genius, I bought a Fiskar reel mower. I blogged about wanting a Fiskar a few years ago. It’s a beautiful machine, well built and stout as all get out. But I didn’t find out until I got it back to The Ridge and all put together that it won’t cut anything that’s taller than 6 inches. The grass and weeds in my yard are much higher than six inches right now. The Fiskar made a dent in the grass. You can see where I pushed it in the really thick area. But tomorrow, I’ll stop at Harbor Freight on my way back and pick up a corded weed eater and something to hold the trigger down while I get the grass low enough to use my new Fiskar. The old lawn mower? I’ll pick up a spark plug kit at Harbor Fright, too, and clean the plug to see if that will make a difference. But I probably won’t do that for a few weeks while I concentrate on getting the grass down to a manageable height. I’ve basically spent the last month or so up there watching the grass grow. Did I mention that The Ridge is just east of Dull?